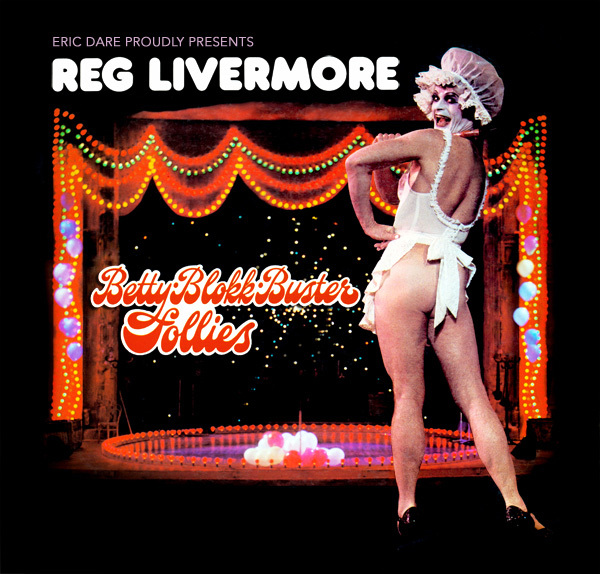 one-man shows in Australian theatrical history"
In April 1975 Reg Livermore stormed the stage of Sydney's Balmain Bijou Theatre with his groundbreaking show Betty Blokk Buster Follies. A tour de force, an irrestible blend of music and comedy, the show caught the imagination of audiences all round Australia filling theatres wherever it played. This record of the show was released in cinemas during 1976 and is at last available DVD! Songs include Family Of Man, Hello In There, Captain Jack, What Makes A Man A Man, The Entertainer and Celluloid Heroes, with well known characters, Betty Blokk Buster, Tara the Incredible, The Old Man and Vasaline Amyl Nitrate. The original Sydney season of Betty Blokk Buster Follies in 1975 lead to the release of a vinyl double album which was a chart topper for many months, it received 2 gold records and then a platinum. It was a must have album of its time. It has now been reproduced on CD. Songs include Family Of Man, Hello In There, Captain Jack, What Makes A Man A Man, Is That All There Is, Walk On The Wildside, Train, Travelling Prayer, Ticking, The Entertainer and Celluloid Heroes amoung many more.